The EIC Horizon prize “Artificial Photosynthesis” has been launched. 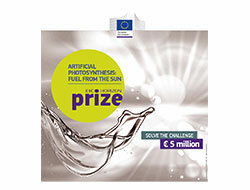 EIC - Fuel from the Sun The €5 million award will go to a new solution for combining sunlight, water and carbon from the air through artificial photosynthesis that will produce sustainable fuel. The competition was opened during the high-level One Planet Summit convened by French President Emmanuel Macron in Paris. The prize is part of the EU's efforts to double investments in clean energy-related research and innovation by 2020 under the international Mission Innovation initiative. In particular, it will contribute to Mission Innovation Challenge "Converting sunlight into storable solar fuels". The contestants will have to build a fully functional, experimental prototype device of a fuel production system, integrating the entire artificial photosynthesis process from light capture to fuel production. The deadline for applications is 3 February 2021. More information, including the Rules of Contest, is available on the EIC website.